As Sector Commander, Captain Dean serves as Captain of the Port, Officer in Charge of Marine Inspection, Search and Rescue Mission Coordinator, Federal Maritime Security Coordinator and Federal On Scene Coordinator while directing Coast Guard operations along a 182 mile stretch of Southeast Florida from Sebastian Inlet, to the Miami-Dade/Monroe county line. Sector Miami is comprised of over 900 active duty, reserves, and civilian personnel including over 1300 Auxiliarists, in addition to 10 Coast Guard patrol boats, four multi-mission Stations, two Aids-to-Navigation Teams, the construction tender USCGC HUDSON, and Marine Safety Detachment Lake Worth. Captain Megan Dean reported to Sector Miami following completion of a National Security Fellowship at Harvard University’s John F. Kennedy School of Government. 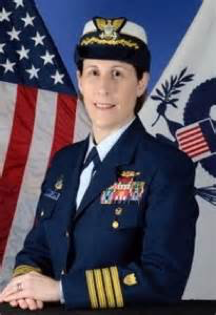 Previously she served as the Deputy Sector Commander at Sector Baltimore and oversaw the execution of Coast Guard operations within the State of Maryland and the National Capital Region. Prior to this, Captain Dean was assigned as Military Aide to the Secretary of Homeland Security and also served at Coast Guard Headquarters in the Office of Performance Management and Assessment (DCO-81). Before Washington, DC, Captain Dean completed a tour as Commanding Officer of USCGC WALNUT, in Honolulu, Hawaii, where WALNUT conducted operations throughout the Hawaiian Islands, American Samoa and Central Pacific Ocean. Captain Dean’s additional assignments include a tour as Aide to the Commander U.S. Coast Guard Atlantic Area in Portsmouth, Virginia, Executive Officer of USCGC WILLOW, in Newport, Rhode Island, Executive Officer of USCGC CONIFER, in San Pedro, California, a member of the Seventh Coast Guard District Office of Law Enforcement and a Duty Officer in the Seventh Coast Guard District Command Center. She began her Coast Guard career as First Lieutenant, USCGC VIGOROUS, in Cape May, New Jersey. Captain Dean is a 1993 graduate of the Coast Guard Academy where she earned a Bachelor of Science Degree in Government. She also holds a Masters in Public Administration from The George Washington University. Captain Dean is a designated Coast Guard Cutterman and her military awards include the Legion of Merit, Meritorious Service Medal, Coast Guard Commendation Medal and Coast Guard Achievement Medal.